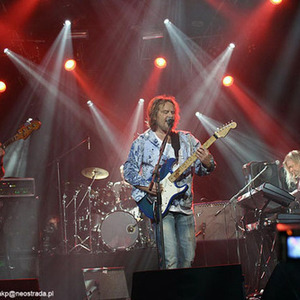 1) Pendragon are an English progressive rock band established in 1978 in Stroud, Gloucestershire as "Zeus Pendragon" by guitarist Nick Barrett. The "Zeus" was dropped before the band started recording. There were a few personnel changes in the early days, but since 1986 the lineup has remained relatively stable. Long standing drummer Fudge Smith being replaced by Joe Crabtree who has subsequently been replaced by Scott Higham who brings high energy along with a huge beaming smile! There were a few personnel changes in the early days, but since 1986 the lineup has remained relatively stable. Long standing drummer Fudge Smith being replaced by Joe Crabtree who has subsequently been replaced by Scott Higham who brings high energy along with a huge beaming smile! The band is still active as of 2012. Their music is characterised by Barrett's virtuoso guitar playing and his highly emotional, if unique, vocal performances. On October 1st 2008 the band released the album Pure. This album features their heaviest songs as of yet, being influenced by the newer Porcupine Tree. Born and raised in Baltimore City, Drag has been blazing through the Hip- Hop scene. His numerous mixtapes have touched the ears of many. A greater following has been gained from the listeners of 88.9 Strictly Hip-Hop, Morgan States Friday night dose of Underground Hip-Hop. PenDragon is a forerunner as one of Baltimores greats. PenDragon produces and writes not only rap but also R&B. Also writing TV shows, movies, and books are steadily draining the ink out of Drags pe ns. When asked about what he wants people to get out of his music Drag says, I want people to know that everything that you go through, someone else is going through that too. If I can comfort someone with what I say, and they can apply that to themselves and make them realize that life is real and everybody, no matter their position, had to overcome something, whether great or small. I want to give a voice to those that are not getting heard. And let them know that it is alright to feel all emotions of life, because everyone does, and its real.